As someone used to seeing Israel portrayed negatively on TV news reports, it was refreshing to attend the Techonomy3 conference in Tel Aviv yesterday and discover a rich seam of technology startup teams with original ideas and boundless ambition. “In Israel, almost everyone has a startup idea,” people kept telling me. Whether it’s the country’s compulsory military service that shifts young people’s view of the world in a direction that’s different from other parts of the world, liberal immigration laws, or maybe the country’s limited natural resources forcing people to think creatively – whatever the reason, the many entrepreneurs I met there had a real fire in their eyes when they talked about the companies they’re building. 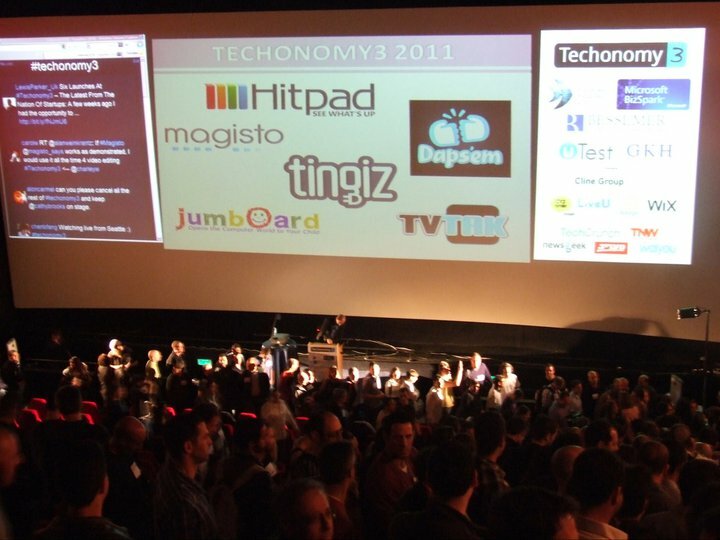 Techonomy3’s organisers hit on the genius idea of holding the conference in a cinema. Seeing startups pitch their ideas in front of a crowd sat in tiered seating, while their product demos were projected onto a twenty-feet high screen, gave the event a unique flavour. Hitpad launched an intelligent iPad app for getting the latest news, personalised to your tastes, quickly and with minimal effort. Daps’em revealed its ‘platform for appreciation’, allowing users to show their thanks to others with a ‘virtual fist-bump’. Magisto unveiled an exciting technology for transforming home movies into fun, shareable clips with a single click. Tingiz stepped into ‘Internet of things’ territory, with a solution that will allow businesses to give their real-world products simple, useful web presences. TvTak revealed an app that can recognise the TV show or ad that you’re watching within one second from a photo of your screen. Jumboard demoed its combined hardware and Web app solution for making computers more toddler-friendly. So, six strong contenders, but in the end Magisto came out as the judges’ favourite. The disruptive potential of being able to automatically transform shaky home movie clips into something fun and shareable with absolutely zero effort is staggering. Beyond the startups taking part in Techonomy3, I met at least thirty other entrepreneurs in my two days in Tel Aviv, all keen to share their projects with the world. That was just the tip of the iceberg – just about everyone I spoke to seemed to know of many more Israelis working on a fledgeling tech business. Despite all this activity, the scene isn’t perfect. A recurring topic in my conversations with entrepreneurs was a real shortage of early stage venture capital. Many projects are bootstrapped on tight budgets. Still, the community is hugely supportive of success. I heard stories of how when a local firm does get investment or is acquired by a major technology firm, it’s cause for great celebration across the startup community – there’s no feeling of bitterness that one company got funded while others didn’t. My short time in Israel gave me an appetite to learn more about what appears to be a mutually supportive, friendly but incredibly passionate and ambitious scene. Oh, and there’s a great sense of humour evident in the startup community too. Here’s some frank advice for Mark Zuckerberg in a video that opened Techonomy3 (a few NSFW words in here, by the way).